Treat your hands right with this professional exfoliation for your hands. 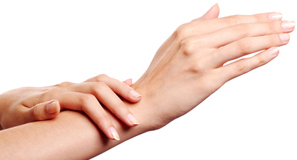 Applied to the top of your hands, it will make dry rough skin disappear within a matter of minutes. What is left is softer, smoothing looking skin. Spa Oro Blanco focuses on creating a relaxing and harmonizing environment, while providing products and treatments that deliver visible results. Spa Oro Blanco is a place to relax, rejuvenate, and restore your skin. Sign up here to receive exclusive specials in your inbox!